A wee bit of the Irish luck for ya--in the form of a Shamrock! Perfect for St. Patrick's Day and sure to make you pinch proof! Made to fit the 4x4 hoop. Chevron Shamrock: 1.5, 1.75 and 2.00 inches. Snap slip cover: Fits 2.00 inch/ 50mm snap clips. This cute little felt snap clip is made in the hoop! 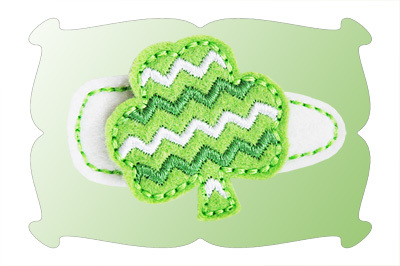 Made to match our Shamrock Times 2 applique! All designs on this page are made to fit the 4x4 hoop. Design files are included to make one at a time or make multiples with only 3 color changes. The Chevron Shamrock comes in 3 sizes: 1.50, 1.75 and 2.00 inches. 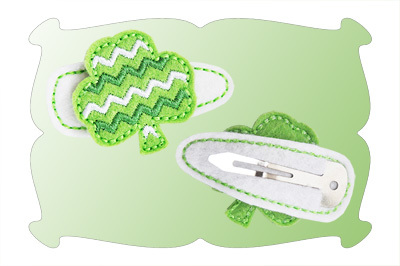 The 2.00 inch size Shamrock can be used as a large snap clip cover. The snap clip cover comes in 1 size: approximately 2 inches and fits the most common size of oval snap clips that are 2.00 inches/ 50mm long. As always, step by step PDF instructions with lots of helpful how to photos included!